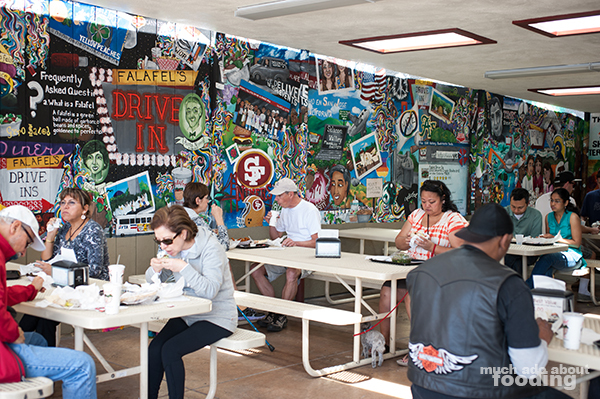 It was through the help of you awesome readers and Yelpers that I made my way to Falafel's Drive-In during my random trip to San Jose. Okay well it wasn't too random but that's only because we made an "excuse" for it. To be honest, a cheap plane ticket convinced us to book a flight up north but to veil ourselves from the lie that we needed to go, we called it Duc's birthday trip. Anyhow, without any foreknowledge of what kind of food the city held, we turned to you all. Thanks for the recommendation! 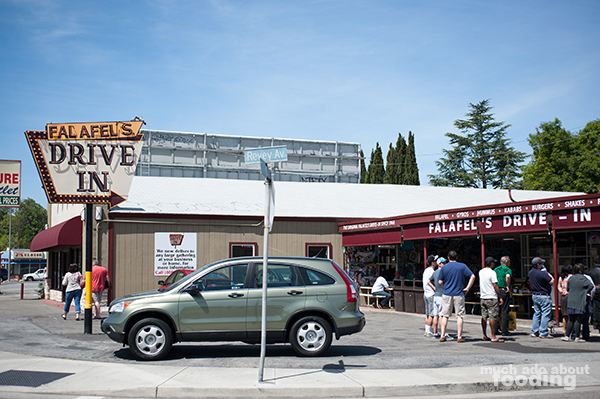 What I didn't know before we stepped foot here was that Duc has never had falafel before. "WHAT?!" you scream. I know, I know. Let's be honest here though - before he met me and we started seeing each other, he lived off of bacon, eggs, Spam, and rice. While that may sound appealing to some of you, ultimately it's not good. So instead, I'll introduce him to fried green balls in San Jose. They do mean drive-in here in terms of set-up but it looks like it has been a long while since the place catered to vehicles. The long line moved quickly as people put in their cash-only orders to get some tastiness in their mouths. 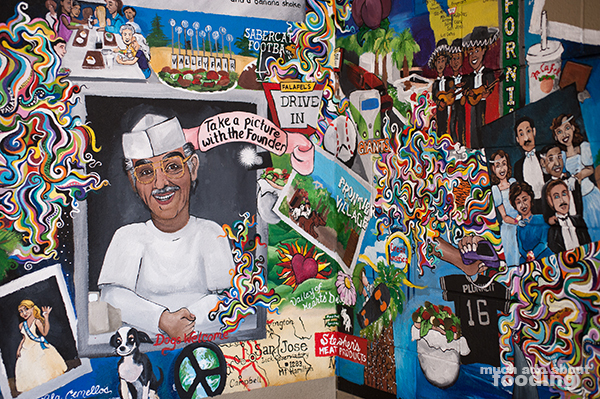 To keep occupied, there was an immense seating area that was covered in an impressive painted mural highlighting the best of San Jose. 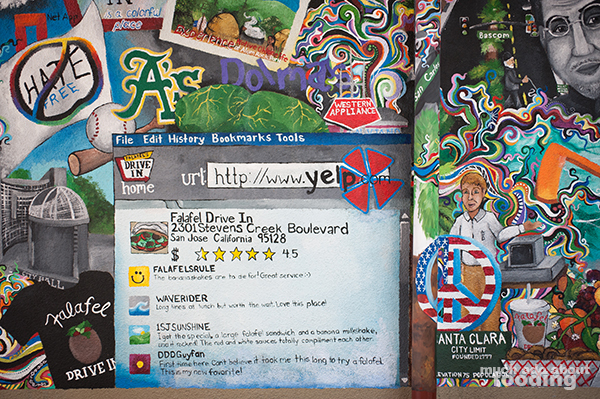 We even saw a neat homage to Yelp painted! So take a look at the juicy goodness that is our order. 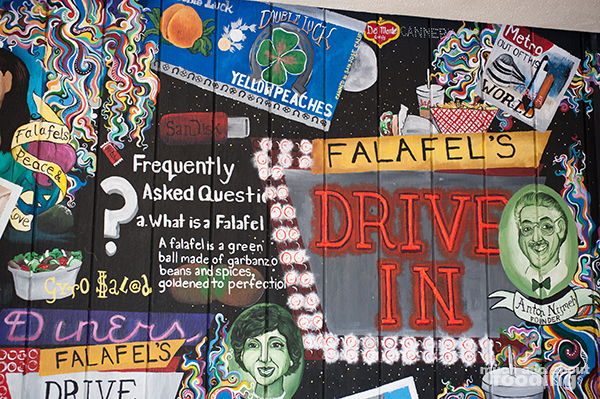 Based on everyone's rave reviews and the namesake, we had to opt for falafel. 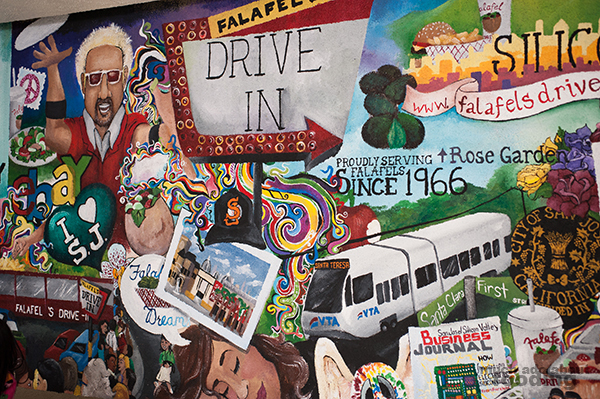 So, we got the Large Falafel ($8.00 in combo with banana milkshake - a delicious pita sandwich consisting of falafel balls, lettuce, tomatoes, cucumbers, tahini sauce, and their famous hot sauce). 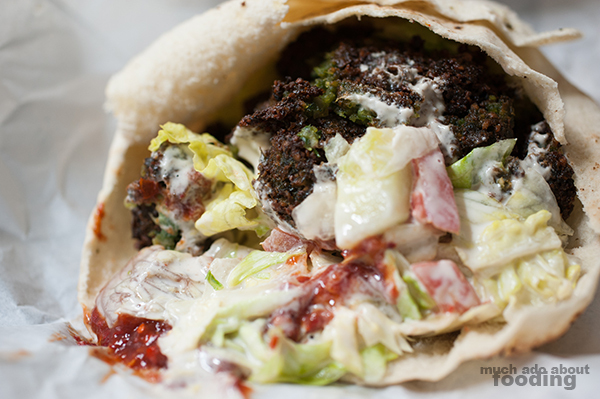 They included quite a bit of the falafel. The custom hot sauce and tahini sauce added the necessary lubrication for crunchy balls BUT the falafel was good on its own. I felt like I would not have gotten through the large myself though because there was a slight saltiness that pervaded after too much consumption. For the both of us, we didn't like banana milkshake at all - it looked like they used plantains (took a peek into the kitchen) which aren't as sweet as the everyday banana until completely ripe. Just a preference remark of course. 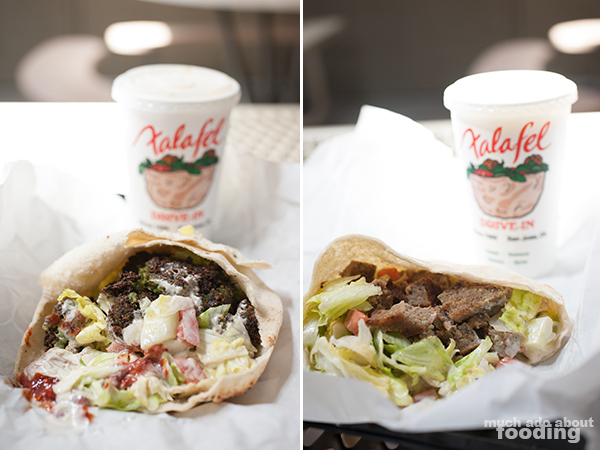 To fill out the meal, we also got the Gyro in a Pita ($5.25 small - a spiced beef steak, slowly cooked and stuffed in a pita with lettuce, tomatoes, cucumbers, and tahini sauce). 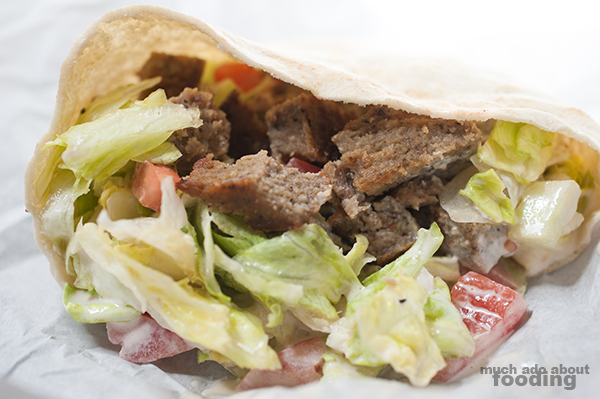 The pieces weren't thinly sliced as I am used to with other gyros in pita but that does not detract from the deliciousness. It's one of the few examples where I see using iceberg lettuce is okay, and I loved the tahini sauce that thinly coated each well-seasoned, soft morsel of meat. Alongside it was an order of their Pineapple Malt ($3.25), a tad disappointing order of a drink with a canned pineapple taste. Overall, still very tasty and we were able to look around the walls to get an idea of where to explore in San Jose next!